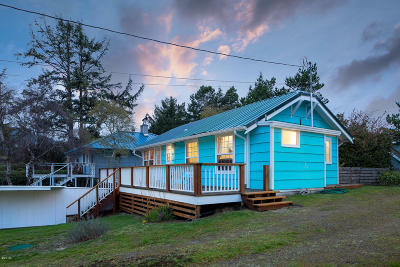 Best BUY in sought after Neskowin Village. This fun, adorable and bright beach Cottage features 2 bedrooms and 1.5 bathrooms. Located just off of the second hole at the Neskowin Beach Golf Course this quaint and cute Cottage will fill your summers with recreation and your winters with beautiful lake/marsh views....A bird watchers paradise. Recently painted and updated exterior maintenance, spacious lot, wood burning fireplace and hardwood flooring. Large storage shed for your golf cart and beach toys. Seize the 2019 SUMMER in Neskowin...FORE!!! Lot Description: 4, 791 sq. ft.